Jan was born in a very small, rural town in Idaho. Born the sixth of seven children, she inherited her mother’s hyper-sensitive empathic nature, her innate gift for hands-on healing and the social anxiety that comes with those gifts. From her German father, she inherited the spirit of entrepreneurship and his generosity. By her mid-to-late 20’s, Jan was beginning to experience the physical manifestations of her emotional trauma – chronic back pain, frequent migraines and recurring bouts of depression (that at one point, hospitalized her). She was desperate to understand how to manage her energy and stress and release her emotional pain. Her sister introduced her to a fabulous chiropractor who opened her eyes to the amazing world of the mind/body connection and she began researching the myriad of holistic healing modalities. In 1996 she discovered Reiki and trained to become a Reiki practitioner. She started offering Reiki healing as a hobby and was actually spooked away by the miraculous healings that were occurring for her friends and acquaintances. Her fears of being perceived as the “Source” instead of a resource to her clients caused her to back away from offering Reiki all together. Intuitively, she knew that there had to be a mindset component for the energy work to be sustainable. 1997 saw the Luther family move to Charlotte, North Carolina. Jan’s mother passed that July and it sent her into a new level of depression. Eventually she realized that sitting home alone all day while her children were at school was not helping her loneliness and depression. She went to work for a company in their Accounts Receivable department and, while her depression and physical pains came and went, her migraines began to resurface. By September, 2001, her oldest daughter was getting married (September 1st, in fact). Her youngest son was entering high school and 9-11 rocked everyone’s world. Miserable sitting in a cubicle crunching numbers and making collection calls, Jan took a leap of faith, quit that J.O.B. (just over broke) and set out to find her path. By the spring of 2002 she had found and begun training with Coachville University and the wonderful world of personal development coaching. She began offering coaching sessions for her friends and family and discovered that her intuition and life experiences and innate wisdom helped give others inspiration, direction and hope. The challenge she had was that there always seemed to be a point in which the client would come up against a mental or emotional block that they just couldn’t let go of. The client would take a step or two forward and then they would overthink things or an old issue would come to mind and then they would slide right back into self-sabotage and fear. Frustrated, she mentioned to her dearest friends that she just knew there had to be another tool; something that would help her move herself and her clients out of these limiting mindset patterns and into a world of unlimited possibility. Sitting in church one morning, her friend, Beverly, rushed into the classroom and, with great exuberance, began to tell her about this new technique she had found called EFT. Lo and behold, Jan discovered that there was, in fact, a woman offering an introductory class on EFT in Charlotte that very week. She called the lady, added her name to the list of attendees, researched the location and impatiently waited. It ended up being a phenomenal experience. Jan chose to work on a “chip on her shoulder” that she was carrying from that job in Accounts Receivable. To her gasping amazement, she felt a literal energetic and emotional shift after just tapping for two minutes. Weird or not, she knew she had to learn more. Jan begged the instructor to teach and mentor her, but the woman was new to the protocol and instead sent her to research the creators website (Gary Craig) where he offered at-home training via VHS tapes to get started. The rest – as they say – is history. 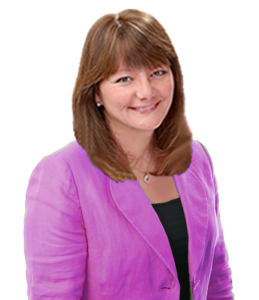 Jan fully immersed herself in the training tapes, audio cassettes, website articles. She was devouring the materials and perhaps overdid it with tapping on herself for 4-6 hours per day. She knew she had resolved tons of emotional issues and dumped her baggage, but the stunning response from her clairvoyant minister really drove the healing home. After her intense immersion into the tapping healing world, she resurfaced at a church event and her minister didn’t even recognize her because her countenance and aura had changed so much. 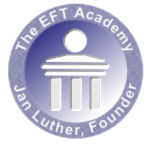 Jan completed the Pace level 1 and Level 2 certification programs and started her own EFT Practice from scratch. She was on a mission to put EFT into the hands of hundreds of thousands of her friends and neighbors and began offering weekly, free introductory classes at churches, bookstores, restaurants and hotel meeting rooms. 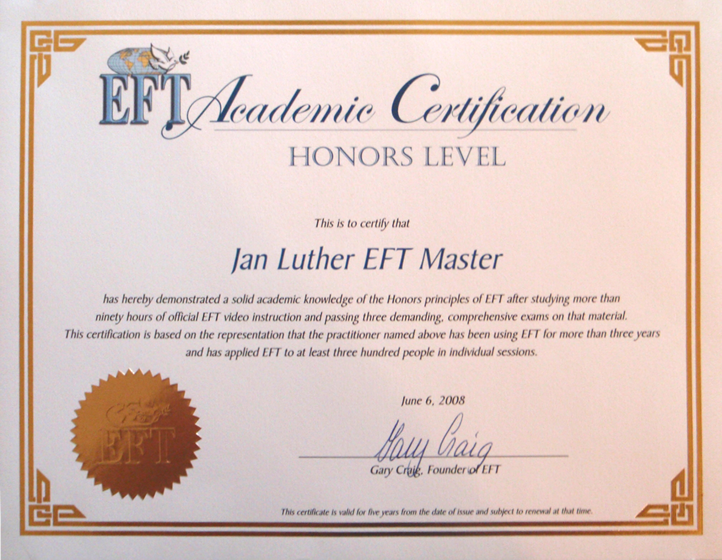 By 2003, Jan offered her first official EFT Training following the official manual. In 2004, Ann Adams created a training packet that included a Gary Craig approved checklist and a fabulous PowerPoint deck. 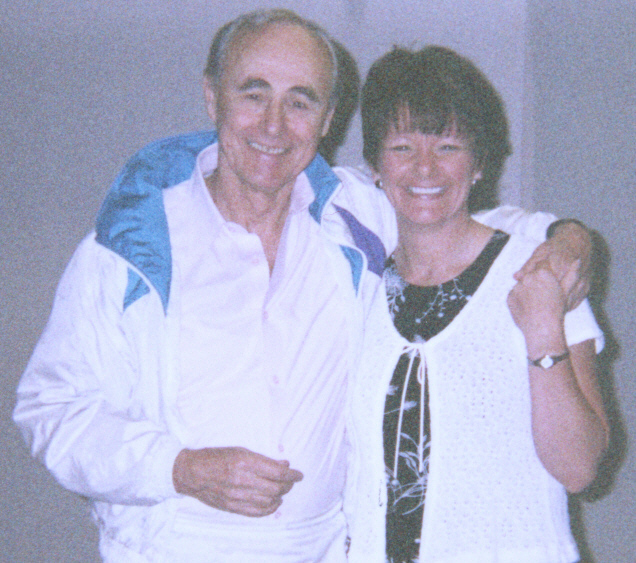 Also in 2004, Jan had the privilege of being among the very first group of EFT Master Practitioner candidates chosen to apply and present before Ann Adams and Gary Craig. In 2005, Jan become one of only nine U.S. EFT Founding Master Practitioners that trained with and was certified by EFT creator, Gary Craig. Life was fabulous. Ann Adams was gearing up to take the EFT Masters around the globe offering community workshops and trainings. Jan was working on a book, was gearing up to join the EFT Masters on tour and was honored to be refusing dozens of invitations to teach, speak and do radio shows. And then… one day, as it always seems to happen in life… the unthinkable . . .
August 5, 2006, Jan’s 22-year old son, Devin, was killed in a single car accident. While the loss was devastating and her family became her focus for several months, she was determined to prove to herself and the world that EFT could heal even this depth of trauma, loss and grief. During the months that followed, she wrote and released her first book, Grief Is…Mourning Sickness® and continued to work a limited schedule with personal coaching sessions. Her love for EFT and her mission to get it into as many hands as possible propelled her to continue offering free workshops and occasional trainings and private sessions every week. In 2009, Jan hired a business office manager, Stokes Adams. Stokes has a degree in Business Management and with her creativity and support, Start Your EFT Practice (SYEP) was formed. At that time, SYEP was one of only two training websites that offered a consistent curriculum of EFT training with personalized EFT skills, mentoring and tapping partners for practice in the United States. And, finally, practitioners needed training and guidance on how to make a successful and profitable business using EFT. This new formula became the foundational model for The EFT Academy in 2009. With these three pieces in place our practitioners began to flourish in their personal growth, their success with clients and, of course, as they followed the training steps provided they began to have tremendous success in their businesses. Lynne Shaner worked with Jan for training and mentoring, participated in Jan’s Business Mastermind group and started her own EFT Practice. Listen to what she had to say in this 11 minutes of wonderful information and feedback. Now she’s doing a Radio show, two workshops in faith communities, giving a presentation to Georgetown University to a head nurse and chief surgeon with the intention to set up with staff. She’s working with a local law firm for stress management. She’s also speaking at the National Cathedral and speaking to a local wellness community for Cancer. **Jan asked, “What did the coaching program mean to you?”** Giving clear structured guidance. Not merely visualization, hope and expect law of attraction. Set up a marketing plan. Bring in people at different price points / Hitting a home run training. Visualizing my best client – the gift that keeps on giving. Jan’s support and love was huge. Felt connected to and supported in group teleclass. Always felt taken care of. Had an opportunity to participate in the EFT Intensive and validation. Given such personal encouragement that I can do this. A (solo-preneur) – I was SCARED! Other tips that were useful… creating conversations as elevator speech / attraction in marketing. In 6 months—the doors have flown open because she’s doing EXACTLY what Jan taught. NOW 16-20 appointments a week! More than supporting herself financially. Came from corporate background and is on track to do better than there. Taught me to do workshops, gather information and reconnect. Interactions that you gave us a sense of validation so that I have the COURAGE to set up the workshop. I’m in consultation with other psychologists in the area because my clients are speaking about my work with them. One of the intangibles that this program gives is how IMPORTANT this work is and I am able to help. Choosing specifically NOT to work on weekends. I could have more sessions if I want. My practice has grown and I’m targeting corporate work. Many clients pick up 10 business cards to share — YOU TAUGHT me the practical way to encourage them to take them. You taught models of how to give them a benefit for sharing the work. I’ve used your playbook and applied them all! DO IT! Its such a small investment—returned one hundred fold to me. And then another shift happened! In the 2009-2010 timeframe, Gary Craig sent out a letter telling the EFT world that he was preparing to retire. For many of us this was devastating news. Who would carry the torch? Would the EFT Founding Masters step up to fill the void and collaborate to create the new official training program? In essence, what occurred was that Gary sold his EFT business list to Dawson Church. Dawson (an author and researcher). Mr. Church set up a meeting in June of 2010 and called it The Gathering. He invited Ann Adams, the creator of The EFT Masters Training and Certification program, several EFT Founding Masters and many of the most active EFT practitioners and business builders and trainers to join him and discuss establishing a training program for his new business, EFT Universe. A representative from EFT Universe (David McKay) reached out to Jan on many occasions prior to the event to “pick her brain” about The EFT Academy and how she had managed to structure the training, mentoring and business mastermind programs with what was quickly becoming international acclaim. David represented the idea that Jan would be invited to be one of the founding trainer of trainers with EFT Universe. We at The EFT Academy are of the strong opinion that the consultations with David Mckay of EFT Universe resulted in the foundational and instrumental structures that are, to this day, included in the training and mentoring program at EFT Universe. In 2011, the Luther family had a wonderful surprise. A precious granddaughter and her mommy came to live with them. From 2011- 2013, Jan soaked up the love of that new baby girl. Kindred Souls. Soulmates even. It is a love and bond that is difficult to adequately describe. This beautiful child rejuvenated her Gramma’s spirit even more and in 2015 the family celebrated her mother’s wedding and, with that, Jan entered yet another season of life: the empty nest. In 2014, Jan created The EGO Tamer® Academy. A spiritual immersion coaching program that offered a mix of live coaching calls, personal sessions and pre-recorded online healing sessions. The EGO Tamer® Academy has had a powerful impact on the lives of many people. Taking them out of depression, grief, self-doubt and confusion and into deep and profound spiritual communion with God/Divine Inner Wisdom. In 2017, The Resiliency Course began to take shape and by early 2018 the first group of students completed the 6-week healing program that offers astonishing results. Using her copyrighted Grief Inventory and Stress Assessment©, The Resiliency Course implements Jan’s version of The EGO Tamer® Tapping and her fill-in-the-blank tapping template to get to the very core of deep and lingering grief and limiting beliefs. By the spring of 2018 things were beginning to shift again with The EGO Tamer® Academy and Jan sensed that it was time to reassess and renew the vision for The Rejuvenation Station, LLC and each program that falls under that umbrella. It just so happened that Peta Stapleton from Australia was presenting an introductory workshop on EFT for cravings and weight management at Duke University in Chapel Hill. For the first time since 2010, Jan felt the undeniable pull to participate in this EFT event. Dr Stapleton is delightful. Her studies and research are incredibly compelling. The information she shared sparked an interest in Jan to once again revisit the idea of offering training, mentoring and even certification of her own through The EFT Academy. And so here we are. Within a week of that presentation, the original content and materials (being evergreen and easily adaptable) are being put into place to offer a new generation of EFT enthusiasts. Use EFT for your personal growth and healing. Add it to your existing skills and business. Or, if you wish, we can help you Start your own EFT practice!